The wettest Christmas and New Year in living memory have come and gone and still it rains. We count ourselves extremely lucky not to have been as badly affected as others in West Yorkshire - the cautious genes which factored in flood maps when we were house hunting claw some kudos points back to balance out all the times I've cursed their party pooper ways. Our leaking windows and small roof drips are a pain, but nothing compared with having to worry about whether you'll need to evacuate your home come the next weather front. Horrendous. For us, Christmas is a time for hunkering down. We're not generally big on extravagant Christmas rituals, content just to enjoy some quality time together and to touch base with family and friends. Our sausage and mash Christmas dinner a couple of years ago attracted both looks of deep pity from some people we know and cheers from others wearily tethered to family and societal pressures to produce a perfectly roasted turkey with 20 different veg. With the house being so topsy turvy and half-dressed, it doesn't seem right to lavish a temporary tree with decorations this year, but an open fire...well that is high up our Christmas list. Dunc and his lump hammer have done sterling work opening up long bricked-over fireplaces on the top floor, earning us 'treat points' for the renovation bank. 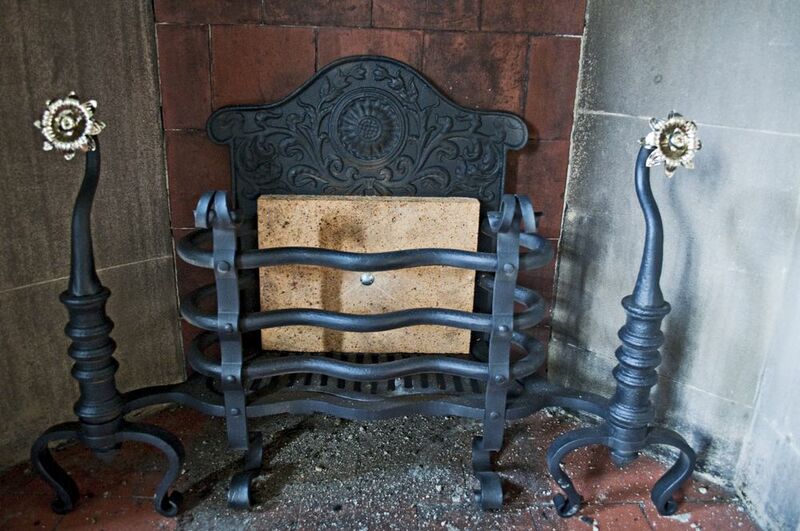 Having finally tracked down someone who is happy to fit reclaimed fireplaces (most fireplace fitters, we've found, are only interested in brand new reproduction grates or stoves), we agree that we've earned the right to start our fireplace treasure hunt. Weaned on 'Bagpuss', I'm a great fan of second hand shops and eBay - in fact most of our furniture has been sourced through online auctions over the years. So this task is catnip. Experience builds quickly, and it becomes clear that there are some pitfalls to avoid. Condition is everything, and a trawl through listings reveals fireplaces in various states of rusty decay and incompleteness. As tempting as it is to bag a 'bargain', we know that once restoration costs are tagged on, budgets easily get busted, so we learn to narrow our search accordingly. Prices also vary wildly, so it pays to take time to search; compare stock and price points across sellers; and to take a deep breath, pretend we're on 'Bargain Hunt', and ask for "best prices". When fireplaces look too perfect and the same designs crop up time and again, the 'reproduction' alarm bells start ringing and the search continues. With a reclamation yard recommendation from our friend Sean and some eBay eye-catchers in mind, we plan a couple of recce road trips.....the full works with service station sandwiches and cans of pop. Our drive out west to Blackburn takes us to R C Lynch - a long-established family firm specialising in antique fireplaces, and, as it turns out, violins. On the back of our online searching, we come with a couple of fireplaces ear-marked as candidates for the top floor bedrooms, but the urge to browse is irresistible. In every nook and cranny there are surrounds and grates stacked one on another - hundreds of designs from various phases of history and restoration. We fall in love with a combination fireplace featuring flowing art nouveau lines and, the clincher - roses. Our second reclamation yard trip takes us out towards York and proves just as fruitful. The fireplace in the old dining room at Briarcourt was the first we excitedly unveiled from underneath its stainless steel cover last December, only to find it stripped bare.....the beginning of a pattern as it would turn out. As a possible location for a Christmas fire, this void seems like a good bet. It is already clad in heat-proof quarry tiles and needs only a free-standing dog grate and not a built-in fireplace. There's just the matter of checking the flue and ensuring that the chimney is safe to use. For this, we use the efficient and cheerful services of Emma Roddy from Sparkling Flues to see us right. Dunc takes a look at her website and is totally bemused by the idea that in addition to chimney maintenance, she also advertises a service where she will attend weddings in 'full chimney sweep attire including a dirty face'. Cultural traditions aren't his strong suit. So, we're all set. Fire basket. Check. Clean flue. Check. Smokeless fuel (we're in a smoke control zone). Check. Christmas guests (mum and dad). Check. And so it is we have our very first Christmas fire. In all honesty, it's a bit on the smoky side....Emma warns us that it takes a while for a chimney to warm up after it's been out of action for years, so it will draw more effectively over time. And then there's the 'smokeless fuel'.....which actually turns out to be very smoky until it gets going, but we put that down to 'user error' - a better base of kindling should help next time, we reckon.